2. We put into the kits an evenweave fabric, today it is Zweigart in all the kits, variations are possible in the future. The fabric is cut off along the thread to avoid distortion and processed by overlock, so that it is more pleasant and more convenient for you to work with our kits. You can immediately take it out and start embroidering, without wasting time on boring preparatory stages. The borders of the fabric on each side are at least 5 cm. 3. You can attach our charming, stylish and very strong two-part magnet needle minder directly to the fabric. Many people use similar needle minders to fix the needle, we suggest using ours to fasten the fragments of the chart to the work. For this purpose, we put in each kit an additional embroidery chart divided into separate elements. Live positive designs of the magnet needle minder echoes the design of the kit, they will be pleasing to the eye when working and could be become an interesting accessory on the photo when you decide to share your embroidering process on social networks. 4. Our hand-dyed threads are based on Spanish cotton floss Finca or French cotton floss DMS. Primitive embroidery often involves an “antique look”; using hand-dyed threads is one of the ways to get this effect. Partial dyeing adds charm and mystery to our designs, each embroidery becomes unique, you will not find two identical works. We put into the kit some more threads that needed so you will not come short of it, considering the different features of embroidering with sectional dyed threads. 5. Color symbol chart with instructions does not teach you how to insert fabric into the hoop, we assume that you know the basics. We give instructions on how to work with the hand-dyed threads and how to take care of the embroidery made of hand dyed threads on linen fabric. An additional chart divided into fragments is our finding we are proud of. 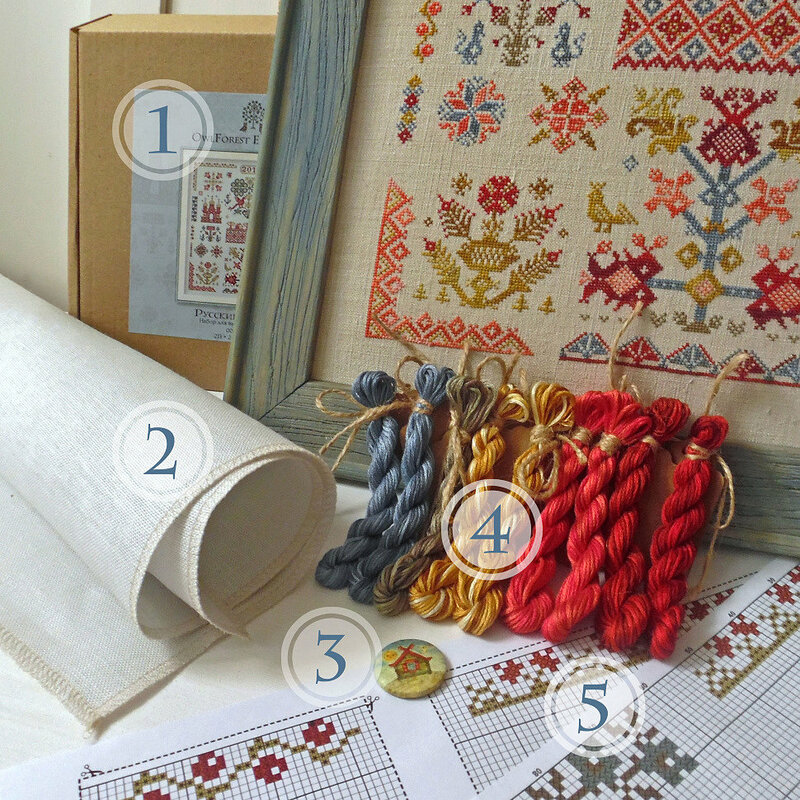 The additional chart can be used in different ways: you can cut it into fragments and attach the element to embroider with the needle minder to your work or you can use them as separate patterns or make your own designs from the sampler fragments. Hi, are you going to make a kit for the Wizard of Oz stitchalong? We plan to make a kit with the design of the stitchalong but it will be after the whole mystery is over after having shown the last part of the pattern.